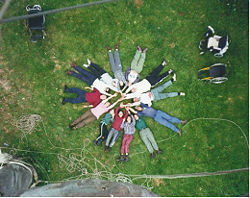 A group of Outward Bound participants with physical disabilities after completing a ropes course, 1996. Outdoor education refers to organized learning that takes place in the outdoors. 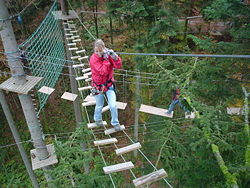 Drawing upon the philosophy and theory of experiential education and environmental education, outdoor educational programs often involve residential or journey-based experiences in which students participate in a variety of adventurous challenges such as hiking, climbing, canoeing, ropes courses, and group games. Survival training, a discipline that instructs individuals on the methods of surviving in isolated and dangerous environments without the benefit of modern conveniences, is often considered a sub-category of outdoor education. Outdoor education programs are intended to provide a variety of learning experiences. These include individual character-building through facing physical challenges; team building and trust in others; as well as direct experience of nature and learning skills to survive and enjoy the outdoors. While not all programs are equally effective in achieving these goals, the experience itself is generally enjoyable and the skills learned could prove invaluable. Thus, when sufficient safety measures are taken and qualified staff members are involved in the training, outdoors education and survival training have many positive aspects as educational programs. Modern outdoor education owes its beginnings to a number of separate initiatives. Organized camping was in evidence in the late nineteenth century and early twentieth century in Europe, the U.K., the U.S., Australia, and New Zealand. The Scouting movement, established in 1907 by Robert Baden-Powell, employs non-formal education with an emphasis on practical outdoor activities. The Forest Schools of Denmark are examples of programs with similar aims and objectives. A key outdoor education pioneer was Kurt Hahn, a German educator who founded schools such as the Schule Schloss Salem in Germany, the Gordonstoun School in Scotland, Atlantic College in Wales, the United World Colleges movement, the Duke of Edinburgh Award scheme (which emphasizes community service, craftsmanship skills, physical skill, and outdoor expeditions) and the Outward Bound movement. Hahn was inspired by the potential he saw in youth, but also believed that society at large was responsible for crushing out that potential as children became adults. He designed outdoor styles of education in order to foster discipline, the ability to overcome real, physical challenges and promote teamwork. The positive results of Hahn's systems inspired, and still does, others to develop similar curricula. The second half of the twentieth century saw a rapid growth of outdoor education in all sectors (state, voluntary, and commercial) with an ever-widening range of client groups and applications. In this period Outward Bound spread to over 40 countries around the world, including the USA in the 1960s. This, in turn, spawned many offshoot programs, including Project Adventure and the National Outdoor Leadership School. In some ways, the physical education curricula found throughout the world were inspired by outdoor education. Early expeditions and explorers also played a role in popularizing outdoor activities. During the latter half of the nineteenth, and through most of the twentieth centuries, the public's imagination has been captured by man's physical achievements over nature, whether it be the Edmund Hillary and Tenzing Norgay's first successful ascent up Mount Everest or Captain Joshua Slocum's first solo navigation of the Earth's oceans. These early adventurers showed that a person could willfully push himself to the known limits of physical and mental endurance and survive, and helped to make popular outdoor educational programs. Outdoor education is based upon the belief that people are at their most essential level when outdoors. We remember that we are part of a greater ecosystem and are not as bound by social customs and norms. In essence we are more true to ourselves and it is easier to see people as people regardless of race, social class, religion, and so forth. For many people a high ropes course or an outdoor activity may stretch their comfort zone and cause them to challenge themselves physically, which in turn can lead to challenging themselves mentally. Outdoor education also helps instill the basic elements of teamwork because participants are forced to work together and rely on each other. 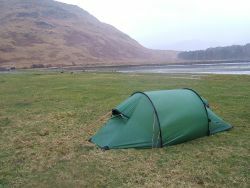 A Hilleberg Nammatj tunnel tent deployed on the beach in Inverie, Knoydart, Scotland. Survival skills are skills that may help one to survive dangerous situations (such as storms or earthquakes), or in dangerous places (such as the desert, the mountains, and the jungle). Useful skills include lighting a fire, finding shelter, making water safe to drink, finding and identifying food, treating injuries, climbing, swimming, and using specific or makeshift tools. 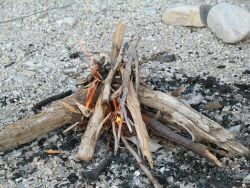 Sometimes basic survival techniques, such as how to start a campfire, are taught to children in organizations such as the Boy Scouts. 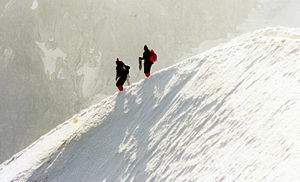 Other times, for those who work in hazardous conditions, such as Forest Rangers, the techniques taught are more involved. Nearly all military personnel around the world, especially Special Forces, are trained in survival methods. Each type of environment challenges a person with a different range of dangers. An environment may be dry, wet, hot, cold, high altitude, low altitude, desert, rural, urban, wilderness, subterranean, or an island. Nevertheless, there are four basic necessities of life which apply in all of these cases; shelter, water, fire, and food (also oxygen for very high altitudes). Finding or making shelter is the most important survival priority because it allows a person to stay protected from the elements, and thus hopefully warm and dry. Finding and maintaining an adequate water supply is often crucial. Humans can live for only about three days without water. A lack of water causes dehydration, resulting in lethargy, headaches, dizziness, confusion, and eventually death. Even mild dehydration impairs concentration, which is dangerous in a survival situation where clear thinking is essential. The ability to use Fire is often an important survival technique because of its many uses, which in include boiling water to kill pathogens, cooking food, including wild-caught fish and game, staying warm, particularly when wet, repelling dangerous animals, provides a sense of companionship and morale boost, signaling to rescuers (bright at night, smoke by day). A human can survive for weeks without food, but hunger impairs judgment and clarity of mind, and makes one weak and susceptible to disease. A basic knowledge of animal trapping, hunting, and fishing will provide meat. Equally important is a knowledge of edible plants, fungi, and lichens. One cannot always rely on the most abundant or most easily accessible type of food. To survive for long periods of time, one must maintain a balanced diet. In order to do this, one must consume a balanced variety of foods. These priorities may shift depending on the environment, though shelter is almost always the most important consideration. For example, in a desert environment, water is typically more immediately important than fire, with the priorities (perhaps) reversed in a cold-weather survival situation. First aid (and wilderness first aid in particular): The ability to perform first aid can help a person survive and function with injuries that would otherwise kill or incapacitate him/her. The survivor may need to apply the contents of a first aid kit or naturally-occurring medicinal plants, immobilize injured limbs, or even transport incapacitated comrades. Navigation: Navigational abilities can often times help lead one out of a dangerous situation and into safety. 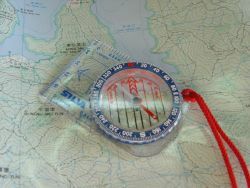 Some navigation skills include Celestial navigation, using the sun and the night sky, reading a map (particularly a topographic map) together with a compass, and/or using a GPS receiver, if one is available. Tools: For long-term survival some knowledge of tools, professionally made or improvised in the wild, can be crucial. The usage and sharpening of a knife or Multitool, climbing and Mountaineering techniques, Ropework, making rope from materials such as the inner bark of trees, other plant fibers, or animal sinews, knowledge of knots and their applications, making a raft or boat and basic rifle/handgun marksmanship, both for hunting and defense can all play a critical role in outdoor survival. Training survival skills has two components: mental competence and physical fitness. Physical fitness includes, among other abilities, carrying loads over long distances on rough terrain. Mental competence includes the skills listed in this article, as well as the ability to overcome panic and think clearly. Theoretical knowledge of survival skills is useful only if it can be applied effectively in a real survival situation. Several organizations offer training in survival skills, which ranges from introductory courses lasting only a day, to field courses lasting as long as a month. In addition to teaching survival techniques for conditions of limited food, water, and shelter, many such courses seek to engender appreciation and understanding of the lifestyles of pre-industrialized cultures. Outdoor education occurs, in one form or another, in most if not all countries of the world. However, it can be implemented very differently, depending on the cultural context. Some countries, for example, view outdoor education as synonymous with environmental education, whilst other countries treat outdoor education and environmental education as distinct. Modern forms of outdoor education are most prevalent in UK, USA, Australia, New Zealand, Europe, and to some extent Asia and Africa. After the Second World War many local authorities in the UK emulated the Outward Bound principles and set up their own outdoor education centers for school children. Visits to these outdoor centers were often subsidized, allowing many children from the towns and cities their first real experience of the outdoor world. By the late 1980s most UK local education authorities had an outdoor education center, and there was a growing private sector offering similar experiences. Government moves to offer more autonomy to schools have badly affected this provision. Under regulations for the local management of schools that took effect in England and Wales from 1992 onwards, the majority of the money spent on education in the UK now goes directly to the school, and local authorities often find it difficult to subsidize their outdoor education centers. As a result many have closed. A significant change in outdoor education in Great Britain came as a result of the Lyme Bay kayaking tragedy in March, 1993. This tragedy accelerated governmental discussions until, in January 1995, the Activity Centres (Young Persons’ Safety) Act 1995 was passed through Parliament and an independent licensing authority, the Adventure Activities Licensing Authority (AALA) was formed in April, 1996. Overall, the AALA appears to have succeeded in its mission, but it has also created debate regarding whether it is possible for young people to experience adventure in an 'educational way' within tight regulations. Some people view AALA regulations as tight and thus, restricting their opportunity to provide what they believe to be meaningful outdoor education. There has been concern expressed about the decline in the number and quality of school trips in the UK. In 2005 the Parliamentary select committee on Education published a report on 'Education outside the classroom' which called on the UK government to do more to protect and promote outdoor education. In response the government promised to issue a manifesto for outdoor education, setting out what schools ought to offer their pupils. A team of Varsity Scouts getting ready to head out on a backpacking trip. The origin of outdoor education in the USA is difficult to pinpoint. North American culture, particularly since European colonization in the seventeenth century, has embraced a pioneering spirit. This contributed to the extensive development of organized camping programs during the twentieth century, Outward Bound programs since the 1960s, as well as many related off-shoot programs including Project Adventure, the National Outdoor Leadership School, the ropes course industry, and many other applications including wilderness orientation programs within colleges and universities and adventure therapy. 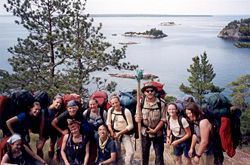 In the 1970s, the Association for Experiential Education was also formed, along with the Journal of Experiential Education which continues to have a strong focus on adventure education scholarship and practice. Outdoor education is relatively new to schools in India. Acceptance is slowly increasing with a few schools advocating outbound adventure based programs among students, to enhance personal growth through experiential learning and increase awareness about various subjects like the environment, ecology, wildlife, history, archaeology, geography, and adventure sports. Some organizations that currently offer such programs for schools are OETS and Wide Aware in Mumbai, and Youreka and Ozone who offer open summer programs based out of Delhi in the north and Bangalore in the south. The term ‘outdoor education’ does not seem to have an exact equivalent in the German language although Kurt Hahn, one of key figures in the development of outdoor education in the twentieth century, was German. In general, outdoor or adventure education is not as widespread in Germany as in other developed regions, such as North America, Australia, and the UK. However, a closely related educational approach called experiential education is commonly applied. Most organizations and companies offering programs and activities based on experiential education for children and youth also offer similar programs for adults and especially corporate teams which are then mostly referred to as 'outdoor trainings'. 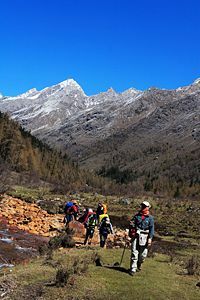 German schools have started to make increased use of outdoor and experiential possibilities when planning their school trips but the experiential approach is rarely implemented in the normal school system and it is by no means as common for school students to experience outdoor education trips as it is other countries. 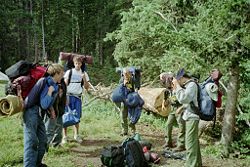 There is much anecdotal evidence about benefits of outdoor education experiences; teachers, for example, often speak of the improvement they have in relationships with students following a trip. However, hard evidence showing that outdoor education has a demonstrable long-term effect on behavior or educational achievement is harder to identify; this may be in part because of the difficulty involved in conducting studies which separate out the effects of outdoor education into meaningful outcomes. A major meta-analysis of 97 empirical outcome studies indicated a moderately positive overall effect of adventure education programs on outcomes such as self-concept, leadership, and communication skills. Interestingly, this study also indicated that there appeared to be long-term positive effects, unlike most educational interventions whose effects tend to fade. Critics of outdoor education have suggested that the philosophical benefits of physical education are hardly ever met, that more often kids and adults who engage in such activity do so the same way that people engage the thrills of an amusement park, without any physical, mental, or spiritual gain. Such critics believe that thrill-seeking is the more predominate motive for such activities, that an appreciation for nature, personal growth, and group dynamics are goals not as often met by the outdoor educational system as is sometimes expressed. On the other hand, the benefits of survival skills are undeniable in a purely practical sense. Thus, while educators may argue over the additional benefits that are to be gained from outdoor education programs, the experience itself is generally enjoyable and the skills learned could prove invaluable. ↑ James Neill, Dr. Kurt Hahn Outdoor Education Research & Evaluation Center. Retrieved January 11, 2019. ↑ Outward Bound Staff, Roots: From Outward Bound to Expeditionary Learning (Kendall/Hunt Publishing, 2000, ISBN 0787276448). ↑ Timothy Bates, Terry McLaughlin, Alan Ewert and Ken Gilbertson, Outdoor Education: Methods And Strategies. (Human Kinetics Publishers, 2005, ISBN 0736047093). ↑ Adventure activities licensing AALA. Retrieved January 11, 2019. ↑ Education and Skills Committee,Education and Skills - Second Report House of Commons. Retrieved January 11, 2019. ↑ C. E. Knapp, "Progressivism never died, it just moved outside: What can experiential educators learn from the past?" Journal of Experiential Education 17(2)(1994): 8-12. ↑ J. A. Hattie, H. W. Marsh, J. T. Neill and G. E. Richards, Adventure Education and Outward Bound: Out-of-class experiences that have a lasting effect. Review of Educational Research 67 (1997): 43-87. Retrieved January 11, 2019. ↑ C. Jones, "Adventure in a Bun" The Journal of Experiential Education 21(1) (May-June 1998): 35-39. Outdoor Education and Environmental Responsibility - ERIC Clearinghouse on Rural Education and Small Schools. Outdoor Education Research & Evaluation Center. Outdoors is Great. Argues for the benefits of the outdoors (The Guardian). OutdoorEd.com: Resource for outdoor & experiential education. Out of Bounds. Examines the 'decline' in school trips in the UK (The Guardian). This page was last modified on 11 January 2019, at 22:36.